Voicent's Appointment Reminder software is an easy-to-use, automated appointment scheduling and reminder system that delivers personalized messages to any phone. When a reminder call is made, the recipient can press a keypad number to confirm, reschedule, leave voicemail, or even speak to someone in your office. With Voicent's omni-channel capabilities, you can send appointment reminders to your clients as a voice recording, text message, and/or email; then collect their confirmations through the same channels. Auto Reminder helps you manage customer appointments and improve customer satisfaction. It saves time and money, reduces no-shows and improves your bottom line. With the built-in calendar scheduling system and seamless integration with your client database, Voicent Auto Reminder is the perfect solution for medical offices and hospitals with multiple doctors. To access appointment data from a remote computer where an Auto Reminder server is running, simply run Auto Reminder as a client. The server computer on which appointment data is stored can be any PC, and runs the same as a client. You can setup multiple users to use one version of Auto Reminder for an organized look at your organization's appointment schedule all in one place. Appointments can be saved to specific doctors and will be color-coded. You can run multiple copies of Auto Reminder clients simultaneously. Since they all share the same appointment database, an appointment added on a client program is added automatically to the server, which can be any PC. Voicent's Appointment Reminder is a one-time purchase with no per call, per text, or per email fees. Plus, our software can integrate with your EMR system and customer database. * Please note AutoReminder is a software program you install on your computer. It is not available in Voicent Cloud service. 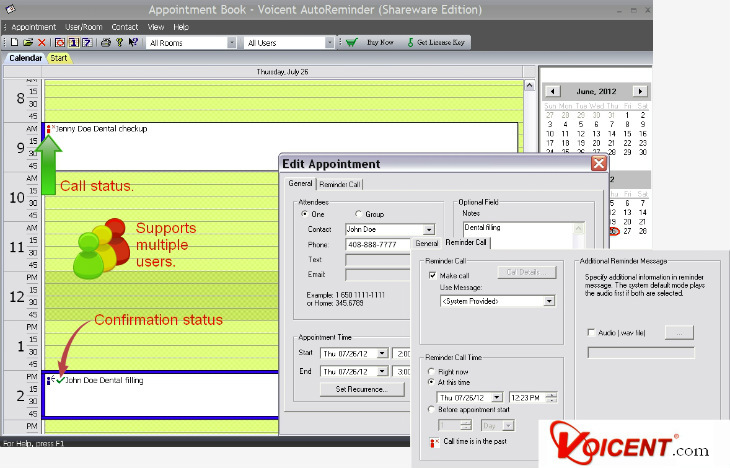 Voicent Appointment Reminder is HIPPA compliant medical software that can be integrated with your EMR system. Designed with our easy-to-use Windows-based user interface, AutoReminder offers flexible integration with any existing office management software. This Windows-based software can use your computer to make calls through a VOIP phone service, such as SIP or Skype, or through your regular phone lines. After the call is made, AutoReminder displays the call status and confirmation status in the calendar window. If there is a voice message, you can simply click to listen. Since our Auto Reminder is onpremise software that works on any PC, you can schedule reminders for unlimited clients, anywhere, anytime. Voicent's Auto Reminder software is an incredibly affordable communication tool. Simply buy it once and own it for life. There are no additional monthly fees, nor are there per-call, per-text, or per-email charges.